You guys have me really fired up about doing my own build. 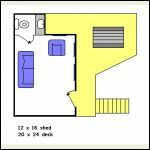 CabinBuilder, cudos to you for starting this site and doing your own project. Anyway, focusing in on a 14 x 20 with a loft for sleeping. Loft entrance is at the back via ladder. Might be room for a turning stair case. Two entrances - one main, the other to a deck. 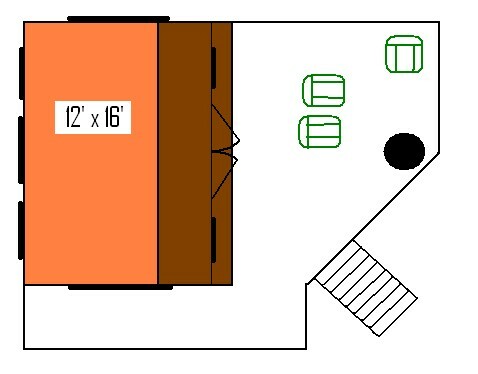 I tried to get the furnishings to scale...the back room could be bathroom or extra bunk space. Would appreciate anybody's thoughts/comments! 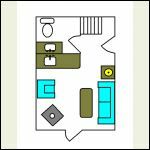 That's nice and well-thought interior layout of the cabin. Good luck with your project. Keep us posted. We'll see - 3 year plan I think. This year's goal will be the foundation. then walls/roof next summer, and final stuff the next year. As budget permits...need a government bail-out. 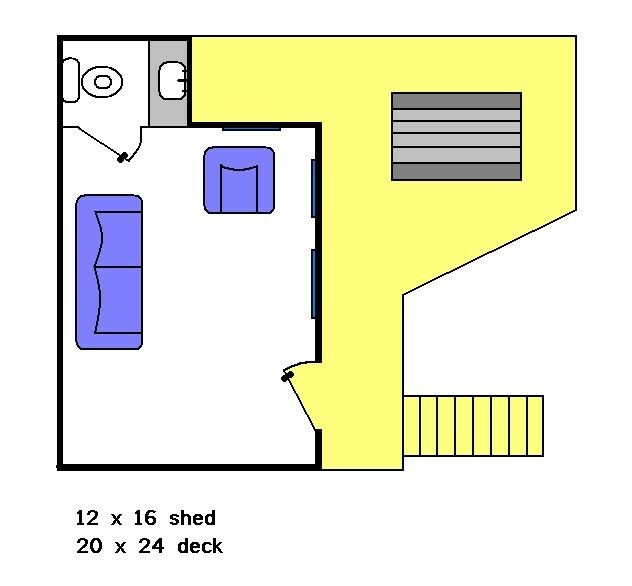 Can a person turn the loft the other way and get additional sleeping area with out issue as long as it is supported properly? David, do you mean running the loft lengthwise? Looks like the floor plan of an A-Frame my grandfather built with a few exceptions: he built an A-Frame outhouse, and the stairs are really a pull-down, folding attic stair (there's a name for that, but it escapes me). He put the steps closer to the edge of the loft to free up the corners for storage. If it didn't have the pull down stairs, I would use a spiral stair case in the corner. As previously mentioned, no commode. That opens up the space nicely, and makes the kitchen more functional. 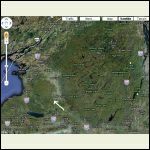 The cabin is near the US/Canadian border. 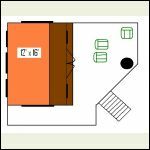 Using an outhouse isn't that big of a deal, especially with an electric heater connected to the light switch in the cabin (just plan a little bit ahead). 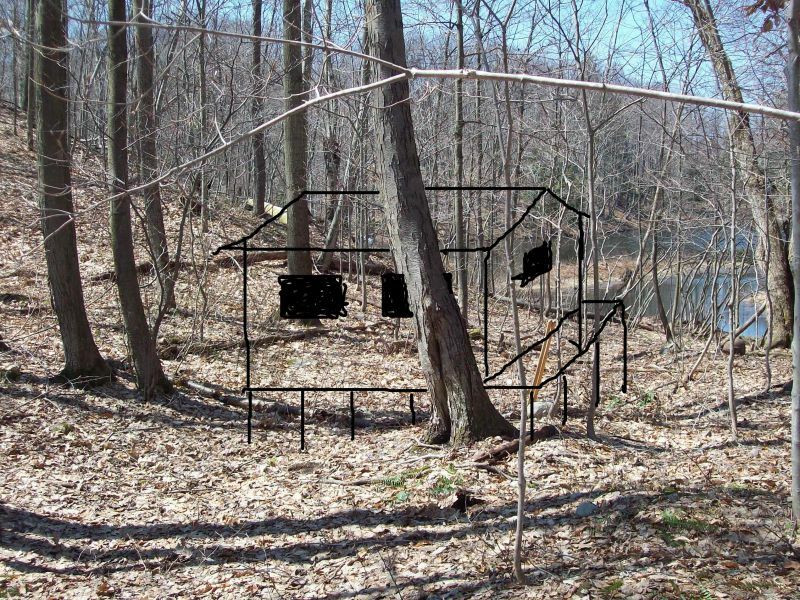 Been doing a lot of thinking about the usefulness of a cabin in the location where I wanted it. The property has a main "hang-out" area down by the water where the kids catch frogs, go fishing, have fires, etc. 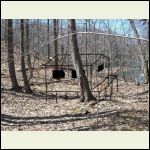 The natural cabin site is on top of a steep hill that's easy to get to from the back, but somewhat of a struggle to climb up to from the "hang out" area. The cabin site has the best view of the lake but not much else going on up there - the most you could do is have a fire. If you were in the cabin and a kid called from down below, you'd have to jump down the hill grabbing onto trees. They are too disconnected. So, I'm thinking 3/4 down the hill where it flattens out a little. Still have a nice view, but closer to the "hang out" and not as much of a hike. A little more private too as it is deeper in the woods. 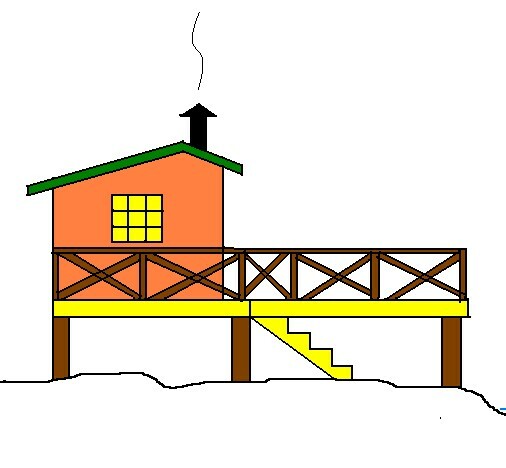 Next thought is what to do in the actual cabin. The choices are eat, sleep, bathroom, and hang out on a rainy day. On nice days, most activity will be outside, eating included. So it's mainly for sleeping, bathroom, and shelter on rainy days. All to say that not a lot of time will actually be spent in the cabin. 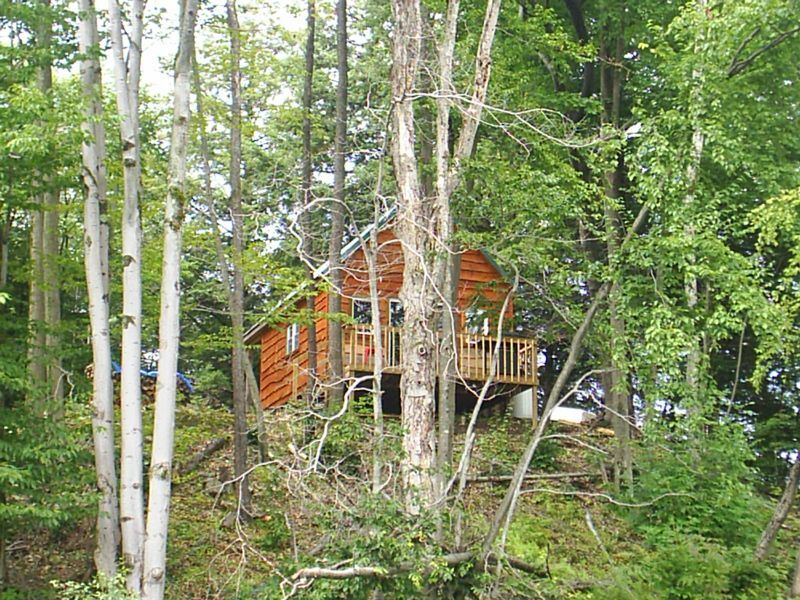 We have a similar dilemma - our small cabin is also up on the hill and away from the water, making it inconvenient to "commute". My buddy told me today - buy a chair lift (LOL). Well anyway, your cabin has been an inspration to so many - I'm not sure how high your story is in Google rankings but it's one of the first ones I found. Tossing up another pic showing a shed-type build with attached bathroom. Found out I have to dig 48" to avoid the frost line - in rocky soil. Yikes. Have you thought at all about steps or at least an alternate route to the water? The only reason I bring it up is, we all get older (hopefully) and you will want to be able to use your cabin later in life when you may not be able to handle that hill anymore. Plus, you will also want your kids to use it when they have kids - will they avoid the cabin if it's not safe for toddlers? 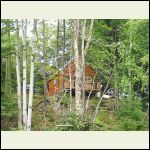 Some cabins are set up based on what we can do now, but I like the idea of setting one up for all stages of life and then passing it on so that someone else can use it for the stages of their life. Great thoughts and I agree with you completely! The high up water view seems like the obvious build site, but in actuality it is the most impractical. It would be a good place for a campfire, deck or gazebo, but not for the central HQ. In my case, it's too high for steps - guessing it would take at least 200. We could go down the back gentle slope and wind around to the water, but in case of an emergency a quick descent would be rough. Actually thinking about bringing a large shed in and modifying it to look like a cabin. Great idea! Two other couples and we have bought locally built 12 X 20 wooden, pre-insulated storage sheds (largest size they could deliver up our curvy road), dubbed "shabins." 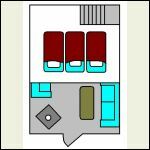 Once leveled and set up, we've begun to improve:laying vinyl tile floor over the rough wood floor, adding windows, paneling walls, and more, especially adding decks/porches to more than double the cabin space. Ours is a gambrel rool, allowing higher walls and loft potential. -How high are your walls planned? Some tall folks can't even sit up in their lofts. -Also, I'm interested in the requirements for the attic type stairs; could they be installed in a plywood loft? 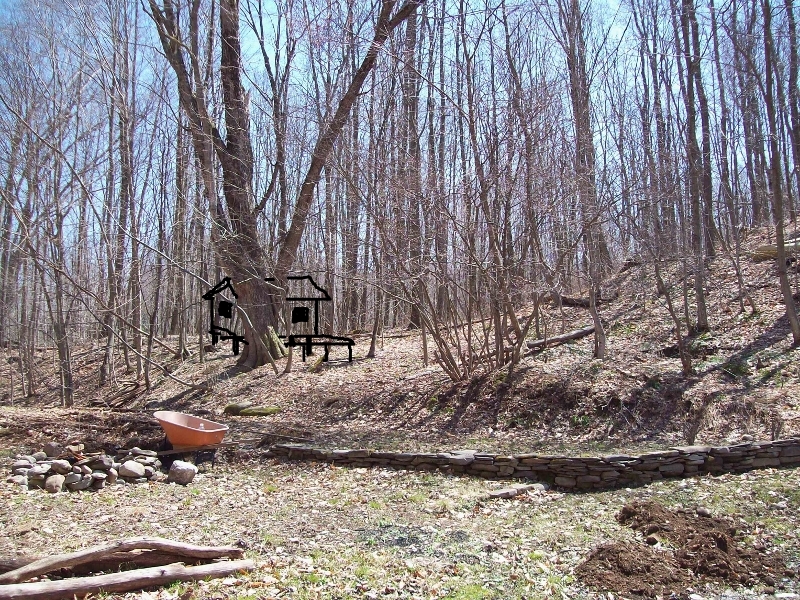 Incidentally, we're going to build in a bath room on the porch with a shower, sink, and composting toilet. Our cabin is very successfully solar powered, too. Good luck! Looking forward to hearing from you and others. We had our 14 by 28 del 2 weeks ago we r happy with the size one 9by1o bedroom and 3 by 10 bath!! That deck looks roomy. Do you have a concern for snow loads? We get upwards of 4-6' of snow and I'd be worried about snow load damage. Great planning on your end! Keep working through the planning stage and take your time planning. Build a scaled model when you think you have it worked out. It is minimum time invested for your prized project! More planning now can help reduce costs and mistakes down the road. Good luck! Hey elk! 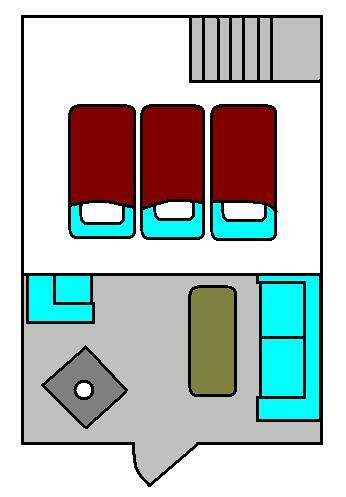 I figured the desk is where most living will take place - the cabin itself will be mostly for bunking. 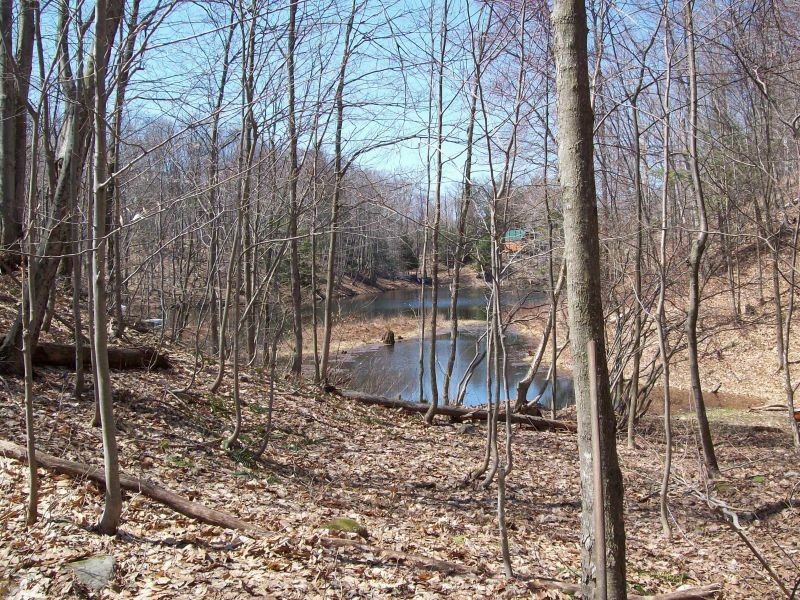 I'm at the foot of the tug hill plateau in NY - 12' up there 2 years ago. I had an old canoe that got pancaked. That said, many people have decks in the area so I know they can build them to take the weight. My project is on hold for now due to lack of funding. I'm waiting for that ship full of gold to come sailing in! I've thought about selling the land and using the monthly payment to just rent a cabin whenever we want to go up there, but the timber value on the land is growing nicely and in 10 years might come in handy. We shall see. Hold on to your land man!!! 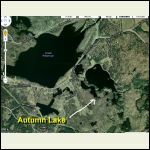 Where is the tug hill plateau? I've been up around saranac lake and lake placid before. Its nice country. 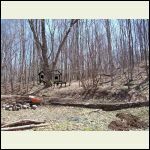 Hi cabinbasics, Where are you in Tug Hill? 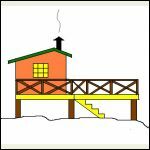 I have a cabin in Redfield. Hey dk! COOL! 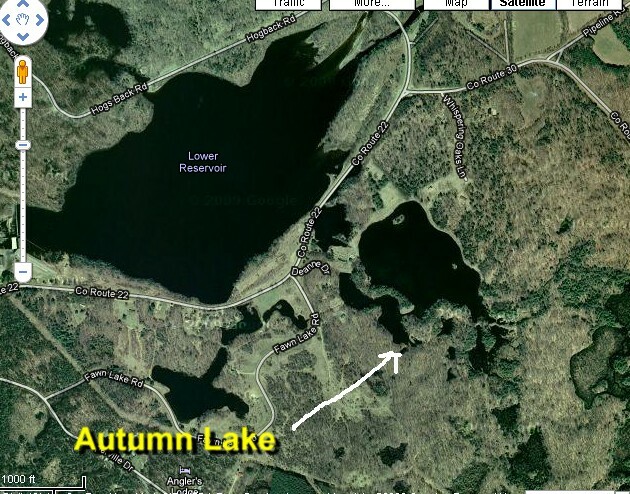 I across the street from the Lower Reservoir - on Autumn Lake - about 7 miles from Redfield. 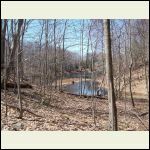 I bought from Jake Basta Land First - So, when did you buy up there? Have you built yet? Nice spot! 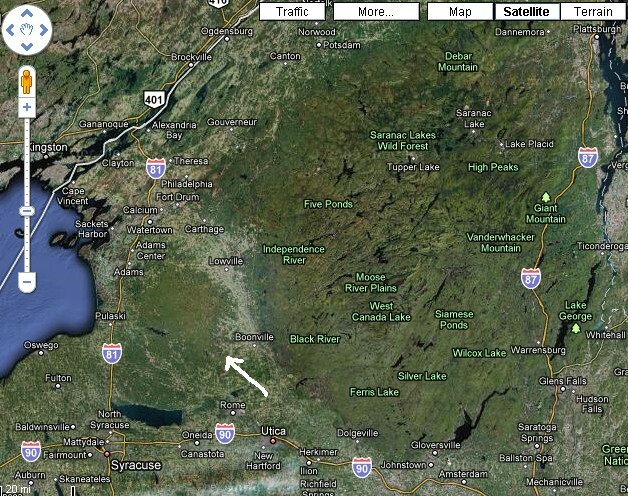 Elk, the Tug Hill Plateau is between Lake Ontario and the ADK park. A valley separates the two areas. The Tug Hill gets clobbered with snow blowing east off the lake. 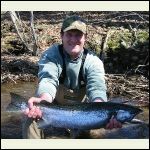 Snow melt feeds many rivers, but the most famous is the Salmon River, probably the most famous Salmon and Steelhead run in the East. Up above the falls is the Salmon Reservoir, a 7 mile long lake that only has a couple developments on it - largely undeveloped so it's pristene just like some of the Adirondack lakes. Redfield is at the East end and, from what I understand, is a snow mobiler's paradise. I love the area - 2 hours from home, and very rich in history. 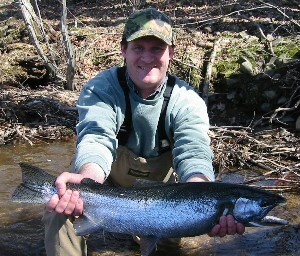 Last pic is a steelhead female from a couple springs back. Hey dk - just saw that you have a cabin. Post some pics man! I was working with the town building guy from Orwell (John Holland) - very nice guy. But 48" down to build any kind of a structure. I had an excavator guy (Huff N Puff Excavating) come and look this summer - 2 days worth of work to clear trees and dig the site - sheesh! One day if I cleared the trees. He was funny though - he said the only thing he's found that keeps the black flies off in May is to use diesel fuel aftershave. I had Christmas & Assoc. put up the cabin. Its 16x20. We have had it for 2 years. I just didn't have the time to do it myself. And with them putting it up I was able to start enjoying the cabin right away. I hope to finish the interior this summer. I love the location. I get up there as much as I can. I have a solar set up. It works pretty good. I love this site. I have been looking at it for a while now. I will post some pics. I like the Christmas and Associate cabins - especially the wrap-around porch one. 16 x 20 is just right! Their web site is nice to go to - sometimes at work I just turn on the speakers and let those birds chirp away! Nice looking fish! Thanks for the information on location. I'll have to check that area out more next time I'm back east. How does a solar set up work with the amount of snow you get in Redfield? I live in Amboy and have been hesitant about getting anything solar with the amount of snow we get. Any Advice? Hello, The solar is ok on a sunny day. With snow on the panels or a cloudy day it takes forever to charge back up. I ran the batteries down to 10.5 volts over New years and 3 weeks later it was at 40%. It was overcast or snowed every day for about 3 weeks. I was disapointed that the batteries were not charged up to 100%. It will charge up to 100% in 3 days if the sun is out all day. I used a battery charger in January to get back up to speed. Well, I'm encouraged again - after getting a quote on excavation last summer that was way over my head. I checked with the town building guy about the possibility of just using a storage shed for a bunk house. That way, no need for 48" piers - just take off the topsoil, and 12" of crushed stone. That's much better on my budget. 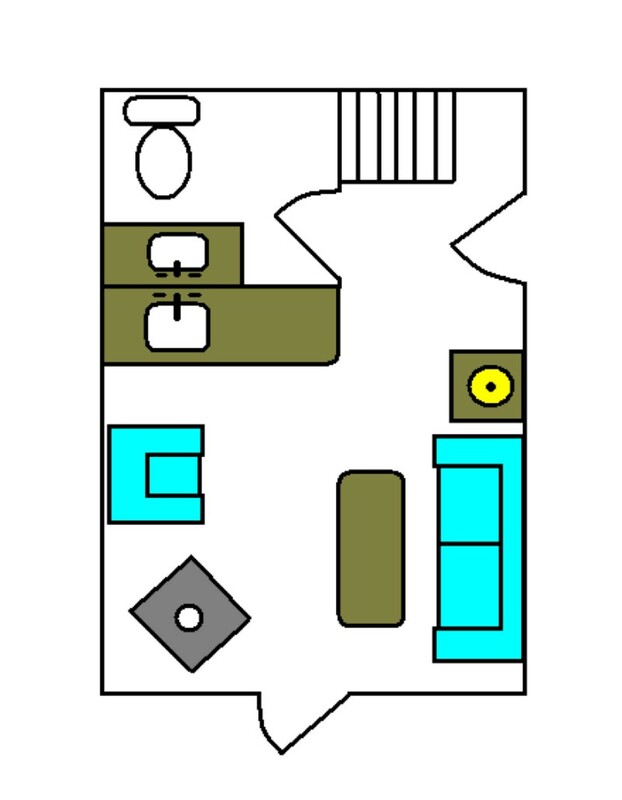 Even a 12x16 size would be fine on that base - just need one big window per room if partitioned. Also, doing away with the deck idea as elk mentioned above - snow load. I like stone patios better anyway - one or two pallets of flagstone over crushed gravel - no staining, no posts, no steps, no snow load worries, and no critters underneath. Comfy on the feet when a little moss grows up through the cracks.